Months ago I happened to catch a colleague updating his blog during office time. Instead of reprimanding him or telling on him (well, I am not that kind of person), I got interested and asked him what kind of blog it is. I found out it is about project management, leadership; topics that may not interest most people but quite a few who are into these stuffs are visiting his site regularly. So my second question for him was, are you earning money from it? His reaction was the typical shrug; Meaning, no. The thought of making money out of it just did not cross his mind. He did not mind sharing his knowledge on these topics, intellectual property by the way, for free! So I pushed for him to add Google Adsense to his site. There's nothing to lose, I reasoned; Just try it. A few days ago he came up to me and disclosed that last month alone he earned 30 Euros through Google Adsense! My initial, uncontrollable, human reaction was envy. Gosh I have been on Google Adsense for more than 2 years now but I have not earned that much in a single month! Of course I am genuinely happy for him, and proud that it was me who suggested that to him. Throughout our conversation I kept reminding him that thanks to me he is now earning passive income. Well I am just human after all. My ego has to be stroked once in a while. What made his blog more lucrative than mine? How can one earn from blogging? It is because of these 3 Cs; The 3 Cs a blog should have in order to generate regular page views and ultimately ad clicks that translate into money. Every article is well researched and well thought of. He invests time and effort creating a quality post that interests his niche market. Also his blog has a single theme. His readers know they what to expect from every post. He has a base loyal readers (customers) who visit his site regularly. He has captured a market, which assures regular traffic to his site. And last but not the least, something that I need to work on is Consistency. He writes at least two posts a week. His loyal readers can expect a new post bi-weekly. The key is, by writing posts at a regular frequency makes your blog unforgettable. Do not allow your readers to forget your blog. 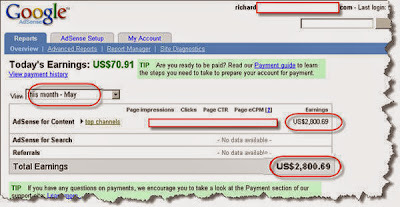 Adsense is just one way to earn through blogging. There are many ways to generate steady income in blogs. Google it and you will find a lot of tried and tested options. Naa isa ka blog na sikat diri sa NC, kaya ni nimo, moadto siya ug pang kids na restaurant, shops, playground nya iya gina review.